This doesn’t mean the rest of the world is shut out if you know a Canadian, they can invite you to join and you can then invite others. Google is rolling out its messenger-like sharing feature in its official YouTube app in Canada and through invites. With this new sharing feature, you can share videos with your contacts through the YouTube app. No need to share through other apps and the new sharing feature lets you chat with the recipient as well. Google is starting with Canada first, they claim Canadians share YouTube videos more often than other parts of the world. This doesn’t mean the rest of the world is shut out if you know a Canadian, they can invite you to join, and you can then invite others. Starting today, when opening the YouTube mobile app, signed-in users with a channel will see a brand new Shared tab. Tap the tab and you’ll be able to add your friends and family as contacts, so you can share with them. Not only can you share and receive videos in the app, you can also chat about them right on YouTube, reply with another video, invite others to the conversation, and more. We think it’ll make sharing easier, faster and more fun on your phone. And of course, if you want to continue sharing videos through other apps, you can still do that too. Shared videos all live in your Shared tab, making it easier than ever to catch up on videos your friends have shared or to show them a few of your own favourites. The new feature will be available in both Android and iOS. If you’ve been using this feature for the last few months, you’re not alone but you were definitely in the minority. Google began experimenting with new ways to share from YouTube with a small group of users a few months ago and now Canada is the first country to roll out this new YouTube sharing feature. 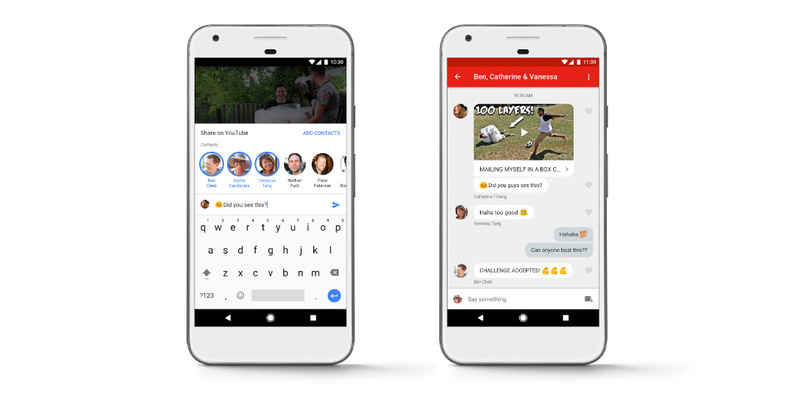 Google seems a bit obsessed with messaging apps lately and you can now add YouTube to the list of messaging apps they have. I’d be interested to hear your opinion on integrating messaging into the YouTube app. Is sharing and messaging in-app something you want? Or are you just fine sharing to your existing social streams and texting? Let us know your thoughts and opinions below or on Twitter, Facebook, and Google+.